Parrying Doubts In Two Capitals, Leaders Sell The Iran Nuclear Deal : Parallels Iranian leaders trying to gain support for the nuclear deal at home are turning to a surprising place for talking points: Israel. The sales pitch in Washington? The alternative would be much worse. 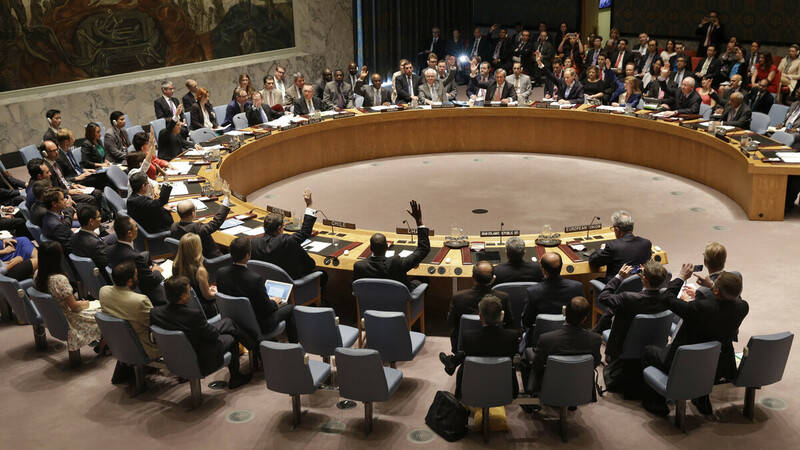 The U.N. Security Council endorsed the historic Iran nuclear deal on Monday. Now, world leaders — notably in the U.S. and Iran — must garner enough support for the agreement at home. The U.N. Security Council endorsed a historic nuclear deal with Iran on Monday, and it immediately drew complaints from hard-liners in Tehran as well as from lawmakers — particularly Republicans — in the U.S. The agreement, negotiated with Iran and the United States, Britain, France, Germany, Russia and China, sharply restricts Iran's nuclear program for the next decade or more in return for relief from painful economic sanctions. But the agreement still has to pass muster in world capitals, most notably in Tehran and Washington, D.C. Here's a look at how American and Iranian officials are selling this very complex and controversial deal to their domestic audiences. The immediate reaction to the deal among Iran's pro-government and pro-military media outlets was to point to who hates it — namely, Israel. The Fars news agency, linked to the powerful Revolutionary Guard Corps, ran a headline announcing, "Israel is the only loser in the nuclear agreement." Press TV broadcast that Israeli Prime Minister Benjamin Netanyahu "is still fuming" over the accord, while the semi-official Irna news agency went even further, suggesting that "your time is over, Mr. Netanyahu." Jim Walsh, an expert in international security at the Massachusetts Institute of Technology, says it's an effective tactic. "Iran has a lot of antipathy towards Israel, and so citing your enemy as saying that it hates this deal could be very persuasive to an Iranian domestic audience," Walsh says. Farideh Farhi, an Iran analyst at the University of Hawaii, agrees. "In some ways, you could say that the panicked reaction by [Israeli] Prime Minister Netanyahu is all the Iranians need to sell the agreement," Farhi says. The argument is especially effective against Iranian hard-liners, who will feel extremely uncomfortable being in the same boat as Israel, Farhi says. "To refer the hard-liners to that panicked reaction and say, 'What are you talking about? Are you going to behave in the same way that Prime Minister Netanyahu is doing?' " she says. The heart of the Iranian sales pitch, however, was stated clearly over the weekend by the man who has the final say on nuclear matters, — Iran's supreme leader, Ayatollah Ali Khamenei. He told a cheering crowd Saturday exactly what hard-liners want to hear: Deal or no deal, Iran's "resistance" foreign policies will continue, no matter what world powers say. "We will keep supporting our friends," Khamenei said. "The innocent nations of Palestine, Yemen, the governments of Syria and Iraq, the innocent people of Bahrain, and the true resistance of Lebanon will always have our support." The assumption in the West is that Khamenei can control critics in Iran. At the moment, concerns are still building in Tehran: State media quoted a Revolutionary Guard general as saying there are "serious problems" with the deal, and a conservative activist expressed worries that Iran's cherished nuclear program is being handcuffed in return for an ambiguous promise of sanctions relief. Foreign Minister Mohammad Javad-Zarif and Ali Akhbar Salehi, chief of the country's Atomic Energy Organization, were due to brief the Iranian parliament on the deal Tuesday, according to state media. U.S. officials are placing heavy emphasis on the nuclear cutbacks Iran has agreed to — uninstalling thousands of centrifuges, getting rid of more than 95 percent of its stockpile of nuclear fuel, and more — while defending the lifting of sanctions as necessary and the only realistic way of achieving a deal. As Congress enters a 60-day period to review the agreement, Secretary of State John Kerry said the alternative is much worse. "If Congress were to kill this, then we have no inspections, we have no sanctions, we have no ability to negotiate," Kerry told CNN. Walsh, the MIT analyst, says it will be interesting to see the debate on Capitol Hill develop in the coming weeks, with a number of lawmakers already caught up in next year's campaign season. "And there's tremendous pressure — there are TV ads running right now in Democratic senatorial campaigns denouncing the agreement and pressuring Democrats to reject it," says Walsh. But he adds that the pressures could shift if a vote on the deal should come up. "When it's time to vote," Walsh says, "the U.S. Congress is going to have to ask itself: 'Do I want to take responsibility for killing an international deal that the rest of the world supports?' "